The diaphragm valve appeared in the 1920s is a special form of cut-off valve. Its opening and closing parts is a piece of the diaphragm made of soft material to separate the body cavity, cover cavity and the drive parts, so it is called a diaphragm valve. The most prominent feature of the diaphragm valve is the diaphragm to the lower body cavity and the upper cover cavity separated, so that the upper part of the diaphragm stem, disc, and other parts are not subject to medium corrosion, which saves the packing seal structure, and there will be no leakage of the medium. Stainless steel sanitary diaphragm valve uses the stem to tighten elastomer film on the seat to block the air path. Rotating the handwheel can drive the stem up and down so that the diaphragm from the seat to open the valve or the diaphragm tight pressure on the seat to close the valve. If the nitrile butadiene rubber diaphragm is used, the valves are suitable for the front-end and drainage pipeline and the noncorrosive gas transport within the temperature of 25 ~ 80 ℃; If the fluorine rubber diaphragm is used, the valve can be used to high vacuum system with a temperature range of - 30 ~ 150 ℃. 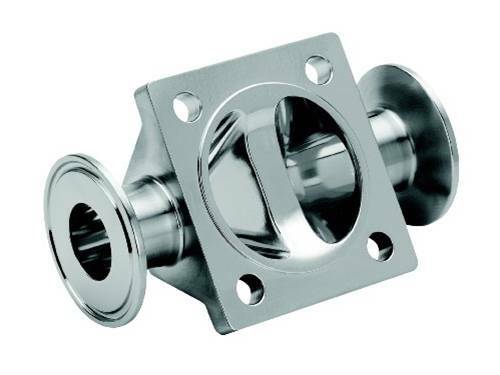 Although the stainless steel sanitary diaphragm valve has a variety of unique performance, each kind of valve body in use has a service life and maintenance cycle. Only the sanitary diaphragm valve maintenance works well, the valve body can better play its performance and have a longer service life. Attention must be paid to the maintenance of the sanitary diaphragm valve in the process of use, and there are detailed descriptions about the maintenance requirements in the operation manual. There are certain requirements for the maintenance of the stainless steel sanitary diaphragm valve. Due to the existence of diaphragm in this valve body structure, there are strict requirements in daily storage. The valve body must be placed in a dry and ventilated indoor, prevent the aging of the diaphragm caused by the damage of the valve body. In addition to the maintenance of a sanitary diaphragm valve, the diaphragm is also an important maintenance part in the process of use. According to different media, the maintenance cycle for the diaphragm is not the same, and it needed to be replaced according to the different cycle so that the valve body can be better used. The metal surface of the valve body must be kept clean without oil stains and appropriate application of rust remover, so as to prevent the valve body from serious oxidation corrosion.